Part 1 will run from 8/31 (Fri) maintenance to 9/14 (Fri) maintenance. Part 2 will run from 9/14 (Fri) maintenance to 10/5 (Fri) maintenance. The above five employees have increased resume rates! ▼ [4 Year Nico Live Commemoration Quest] appears! 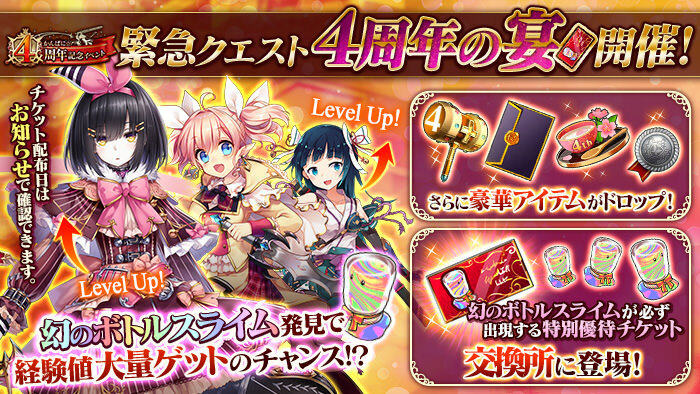 The [4 Year Nico Live Commemoration Quest] where you can earn 4 Shinestones appears. It is based off the live broadcast held on 9/13 (Thu). You can challenge it as many times as you want until you clear it. ▼ Event Exchange Shop updated! ※ Recruit one of the five normal employees Hinano, Rean, Ques, Nomadoa, and Florence. <<Weekly Special>> Special Complimentary Ticket Set purchase limit reset. ※ The main event will end with the 10/5 (Fri) maintenance. ※ All [Limited] items will expire with the maintenance. 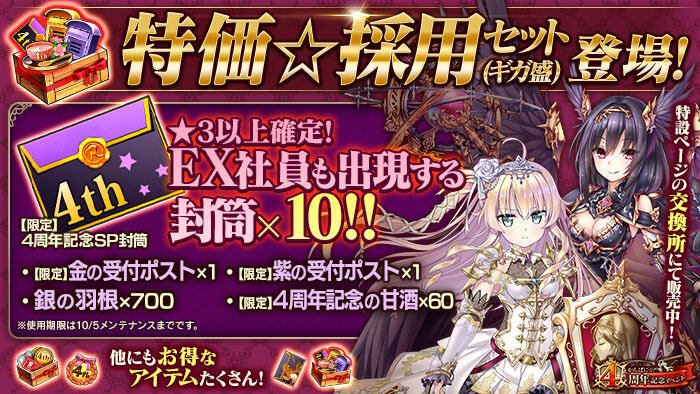 ▼　Popularity Contest Results Announced! 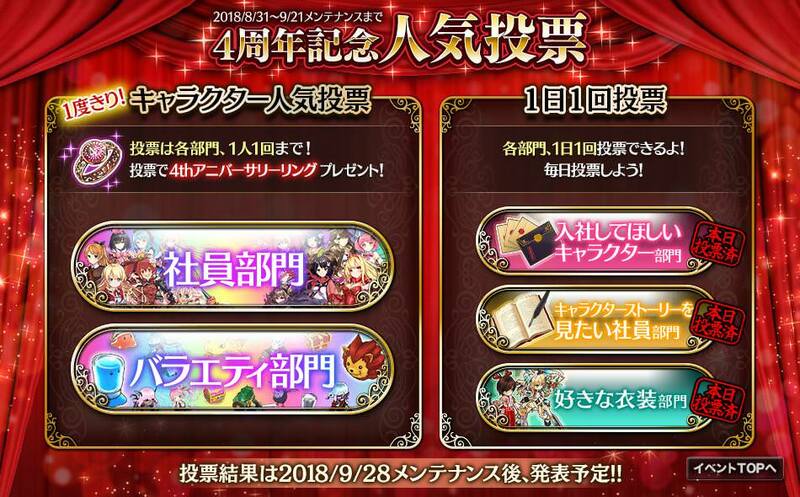 The 4 Year Anniversary Event's popularity contest which ran from 8/31 (Fri) to 9/21 (Fri) maintenance has had its results published. ▼ Event Quest Update Plans! Three new treasure hunting Tour Quests where you can look aim for certain rare item drops are planned to appear on 9/25 (Tue) at 00:00! ※ [Second Half] Treasure Hunt Tours can be sortied to as long as you have enough [Limited] 4th Anniversary Second Half Medals. ※ Recruit one of the five normal employees Mikoto, Caterina, Eir, Lido, and Cynzia. ▼ 4th Anniversary Second Half Medals appear! The medals used in the Event Exchange Shop have changed to [Limited] 4th Anniversary Second Half Medals. The second half's [Medal Consuming Quests] will appear on 9/25 (Tue) at 00:00. 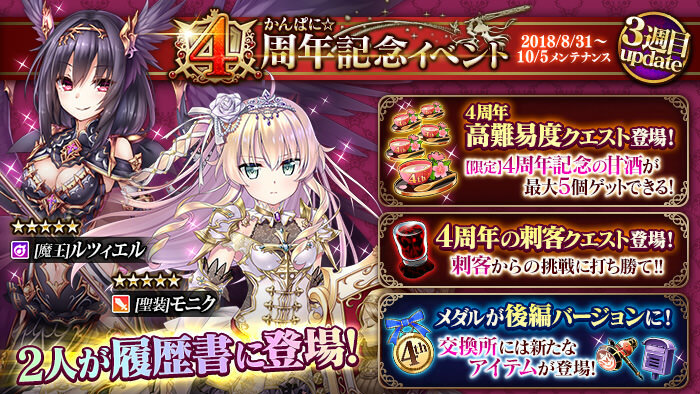 The [High Difficulty Quests] have a total of 5x [Limited] 4th Anniversary Sake available. There is a chance to obtain them from any of the difficulties. The higher the difficulty, the higher chance of a drop. Choose the difficulty that suits you and play. [4th Anniversary Assassin Quest] are quests that feature giant [Assassins] waiting, which you can challenge and more will appear according to the schedule. These quests also feature routes. If you choose to battle the [Assassin] and win, you will receive a [4th Anniversary Assassin Commemoration Coin] as a reward. 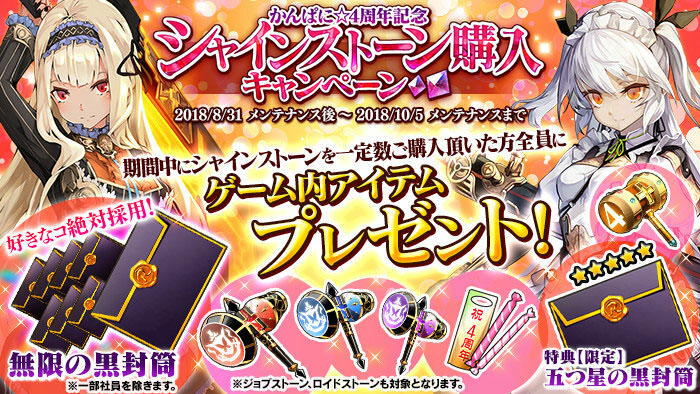 If you choose not to battle the [Assassin], you will complete the quest and receive 3x [Limited] 4th Anniversary Commemoration Candy Sticks up to 5 times, which are used to give EXP to employees using the Raising feature. This quest does not consume Bread, and you can challenge it as many times as you want, so raise your favourite girls and test your strength. 50000 HP. Poison, Burn will do 2500 damage. Immune to magic. ~800 PDEF, outside of criticals, it can be difficult to deal damage. Critical Archers are very effective. President Skill DEF Reduction can make single target attackers work. PDEF Down effects do not work. Burn DEF Down does not work. デッドヘッドバンキング has around 935k Power. Extremely high HP or evasion, with revive can help survive long enough for your damage dealers in the back line to work. Since it only attacks once per round, you can stall with multiple front line units with revive and/or high DEF or evasion. 80000 HP. Immune to all status effects. Immune to physical. Use your strongest Magicians for damage. マーダーエッジ has around 500k~1m power. Even if you focus on HP, you will be oneshot by the ブラッドグリント attack, so focus on speed instead. ブラッドグリント has a power of over 100m. 60000 HP. Likely immune to all status conditions. Regular slimes are not immune. ヘルヘッドバンキング has around 550k Power. Attacks three times in a row so it can be difficult to evade or revive through. Having extremely high HP can work. The regular slimes are not as strong, but can still be threatening if you do not bring enough DEF. If your DEF is high enough, you can simply ignore them. Focusing single target on the Enraged Bottle Slime to kill it first means you can clean up the rest easily after. Target Leader/Target Strongest to focus the Enraged Bottle Slime first. 40000 HP. Likely immune to all status conditions. The fight must be concluded before Round 4 ends. Flying type weak to Archers. 暴君の審判 has around 506k Power. Archers will need enough HP/DEF to survive this for their attacks to be useful, otherwise you won't even be able to clear the fight, so use Soldiers to tank for them. Has around 550 PDEF and 800 MDEF. If your Magic doesn't critical, it will be difficult to deal damage. Very simple to just use the DEF UP skill to tank the first round. 60000 HP. Likely immune to all status conditions. The fight must be concluded before Round 3 ends. It has extremely high PDEF and MDEF so normal attacking is meaningless. DEF Reduction Debuffs are the only ones that work. Furthermore, PDEF Down and MDEF Down effects work at 100%. 散華の凶刃 has around 800k Power. It is possible to lure it to your backline for the first turn so a focused front-line can deal more damage and tank it the second turn as well. 大殺演舞 has around 320m Power. If you have PDEF Down (or MDEF Down) active and activate the DEF Down effect too, it will result in -125% PDEF for a chance to deal significant damage. The President's Skill DEF Reduction can also be used to deal considerable damage. Front line 60000 HP. Back line 2 18000 HP. Centre 9000 HP. Front line has around 200000 Power, Back line 180000 Power, and Centre has 210000 Power. Since the back line is weaker, you can use row attacks to finish them off faster. If you use full screen attacks while healing, you should easily win, even if it takes some time. Immune to most status effects, but paralysis and stun work; however, it recovers fast so Stun isn't very good. For the first four rounds, the attack pattern is 3x → 1x → 2x → 3x. Round five and after is 4x. These attacks have random status effects which can be dangerous, but typically not threatening for a tank, especially with a healer. ▼ The Girls will stop by the Special Event Page every day! 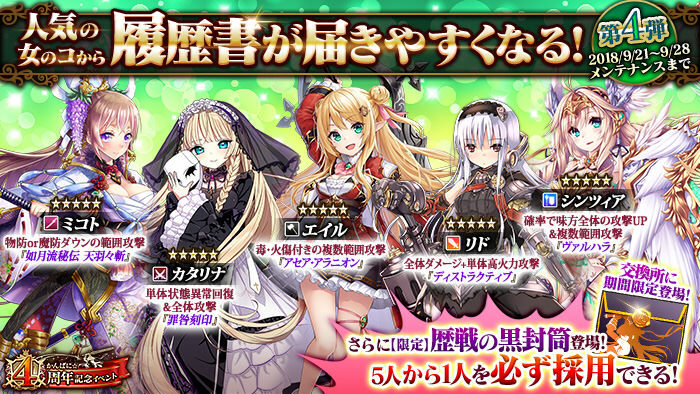 During the event, girls will stop by the Special Event Page every day with presents. Make sure to drop in to not miss out. ▼ Collect Medals from Quests! The Event Quests will drop [Medal] items. These items are required to exchange for goods at the Exchange Shop. These quests, medals, and items will be divided into the First Half and Second Half. ※ The [Limited] 4 Year Anniversary First Half Medals will not be usable after the 9/14 (Fri) maintenance. ▼ Exchange Medals for Items! The [Medals] you obtain from the Event Quests can be exchanged for various items from the [Exchange Shop] on the Special Event Page. The items you can exchange for and the medals used at the Exchange Shop will change when the event switches from First Half to Second Half. During the [Kanpani★4 Year Anniversary Event], there will be [Most Popular Character] and [Daily Votes] available. You can vote for your favourite character ONCE, among the Employee Section and Variety Section on the left. 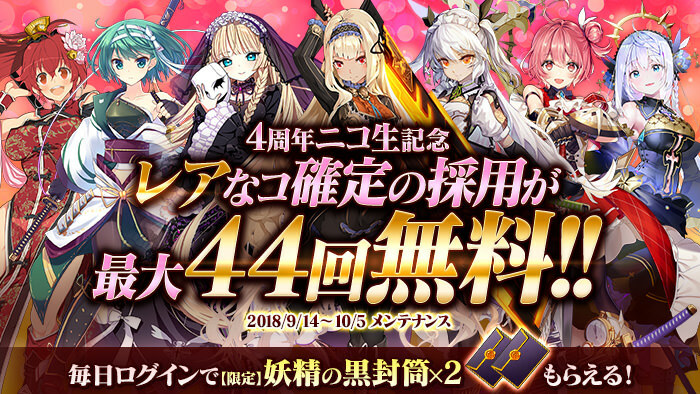 After voting each time, you will receive a 4th Anniversary Ring as a present. You can also vote once per day for your [Most Desired Character], [Most Desired Character Story], and [Favourite Costume] on the right. 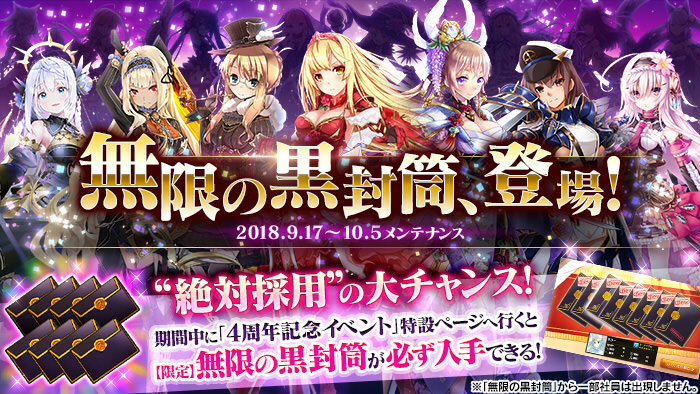 Voting will conclude with the 9/21 (Fri) maintenance. The results will be announced after the 9/28 (Fri) maintenance. ▼ Complete the Event Missions! During the event period, the event First Half and Second Half will each have their own [Event Missions]. ※ Event Missions will change with the end of the First Half and beginning of the Second Half of the event with the 9/14 (Fri) maintenance. ※ Please be warned that you will not be able to accept the First Half's mission rewards after the start of the Second Hal. ▼ Urgent Quest [4th Year Banquet!] appears! During this event, there will be an [Urgent Quest] that only appears during specific times. The Urgent Quest [4th Year Banquet!] will have the chance to drop [Limited] 4 Year Anniversary Sweet Sake, and other valuable items. Furthermore, the illusive bottle slimes [Prism Bottle Slimes] which grant an enormous amount of EXP can be found. When the Urgent Quests begin, you can receive [Invitation Tickets] from the Special Event Page. The [Invitation Tickets] can be used to unlock the Urgent Quests for 30 minutes when used. 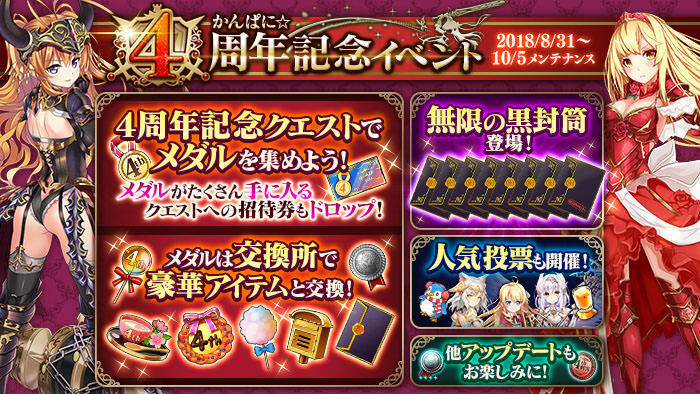 ※ Invitation Tickets that have [Urgent] labeled on them will sortie to the same quest as ones with [Limited] purchased from the Exchange Shop. The only difference is the [Urgent] labels will expire after 24 hours. ▼ Exchange Shinestones for Items! The [Exchange Shop] on the Special Event Page has a section with items on sale for Shinestones. ※ The [Special] [4th Year Banquet!] quest can only be sortied to ONCE. 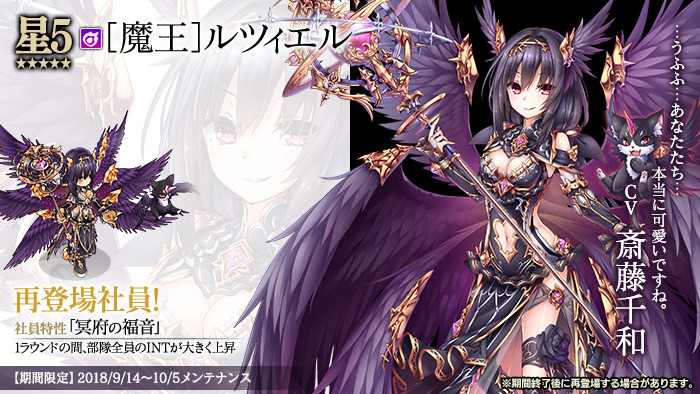 ※ Recruit one of the five normal employees Luciel, Fanaril, Ealice, Elmina, and Ito. Weekly [Limited] Veteran's Black Envelope (2) for sale! ※ Recruit one of the five normal employees Levie, Armonica, Yan, Sarah-Moon, and Vi. 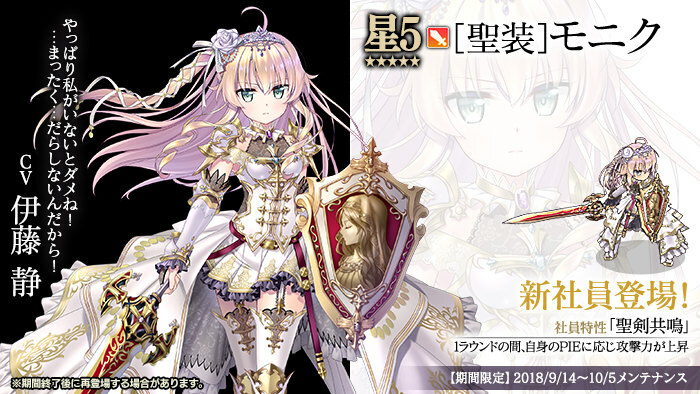 ※ Recruit one of the five normal employees Saga, Camille, Charlotte, Hisame, and Canahart. Recovers 4444 Bread when used. A large coin commemorating Kanpani☆Girl's 4 Year Anniversary. Can be sold for 4,444,444 Gold. A large coin earned as proof from defeating the strong enemies in the Assassin Quest. Can be sold for 4,444,444 Gold. 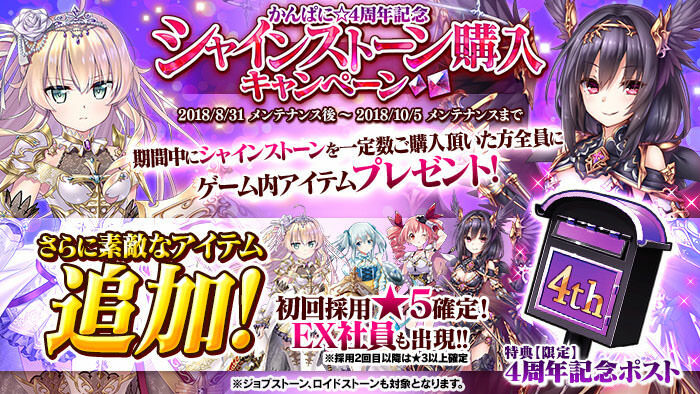 ※ The first recruit will be a guaranteed ★5 Normal or EX Employee. ※ The following recruits will be at least ★3 or higher Normal or EX Employees. ※ If you have multiples of this item, they will appear in separate stacks in your inventory. Unlocks the [4th Year Banquet!] quest for 30 minutes when used. ※ If you have multiples of this item, they will appear in different stacks, but have the exact same effect. During this event, the required gold for Career Up has been reduced from the normal 2,000,000 to 1,000,000. Raise up your employees and promote them! ※ The event will end with the 10/5 (Fri) maintenance. ※ [Limited] items with no icon on the upper left will expire with the 10/5 (Fri) maintenance. ※ [Limited] and [Special] items with the pink icon on the upper left will expire with the 9/14 (Fri) maintenance. ※ [Urgent] items will expire 24 hours after their distribution time. Last edited by Folseus; 10-04-2018 at 06:10 AM. @Mikan I believe she'll be returning in the second half. The SP envelope contains regular black envelopes and has a chance of purple envelopes too though. @Touka I'll do that, thanks. It looks a lot better. Last edited by Folseus; 09-03-2018 at 06:40 AM. woot, no restock the shop. but that new medal map is good, black evelopes here i come.! QQ: Does that mean you can only buy the ticket once or you can only sortie it once after buying?